215 million hours each day are spent on online casual gaming, but what if every day the leisurely hours spent in front of a simple computer screen had the potential to spark positive change throughout the world? Hoopla’s aim is to turn this concept into a reality with a mission to use online gaming to raise both awareness and essential funds for notable charities. The challenge was to create an identity for Hoopla to express a number of attributes, while remaining simple, memorable and differentiated from its competitors. The solution takes the form of word formed from spheres rather than a piece of type. The multiple balls of different sizes represent the idea of a collective of people coming together to form a more powerful group; in the case of Hoopla, individual gamers contribute a larger contribution to charities as a collective, and this emphasizes it. The almost random arrangement of the balls also delivers a sense of fun and energy. 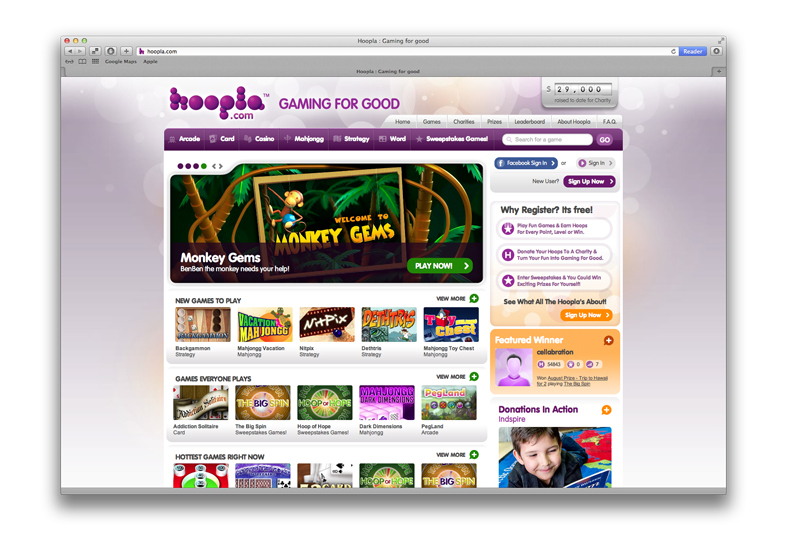 The singular colour palette is important to differentiate Hoopla from its rivals at a glance.